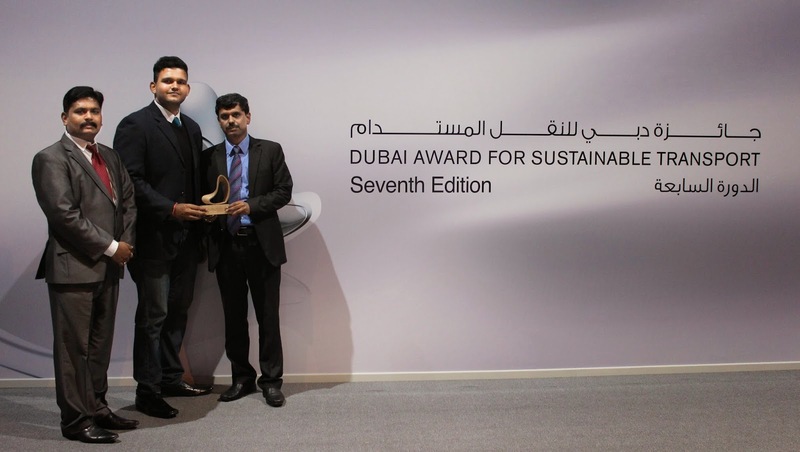 School of Engineering & IT, Manipal University, Dubai Campus project “Sustainable Forms of Energy Usage in Automotive Application” won the Best Student Project Award in the 7th Dubai Award for Sustainable Transport (DAST). The project has also won a prize of AED 10, 000 with the award. The project is an effort of B.Tech-Mechanical, final year student Aditya Ramkrishnan and Mr. Anil Babu, Assistant Professor, Mechanical Engineering, School of Engineering & IT. The award is aimed at raising the public awareness and encouraging community organizations to play an active role in boosting sustainable transport. Under the patronage of HH Sheikh Hamdan bin Mohammed bin Rashid Al Maktoum, Dubai Crown Prince and Chairman of the Executive Council, HH Sheikh Ahmed bin Mohammed bin Rashid Al Maktoum, Chairman of the Mohammed bin Rashid Al Maktoum Establishment has given this award to the Manipal University. The ceremony was held in the Dubai World Trade Center and Ray LaHood, the former US Department of Transportation Secretary, was the Guest of Honor and Key Speaker at the opening ceremony. The event was also graced by Mattar Al Tayer, Chairman of the Board and Executive Director of the Roads and Transport Authority (RTA). The 7th edition of DAST received 120 entries in various categories including best student project and Manipal University was the only foreign University, which has won the award in this event.